And this is where Amy's quote sprang up for me. In this one, Amy was detailing how when the presenter is not from the district there is a greater instance of their perceived credibility, but what we should be moving towards is something I believe she called the "one-eared Mickey Mouse." Okay, I might have made that last part up, but in looking at these images, observing the teachers and presenter today, and from my own experiences in districts or at conference as a presenter, I see Amy's theory as having some definite credence. Why is it that anyone with a great idea from within a district is not taken as seriously as someone who comes in for a day or two and makes the same claims? My all time favorite instance of this was when a teacher in my district was taking the requisite educational technology class for their doctoral program and one of the required readings for the first week was a post I wrote about the need for informed leaders who were models of technological literacy. I had to chuckle a little (and celebrate on the inside). 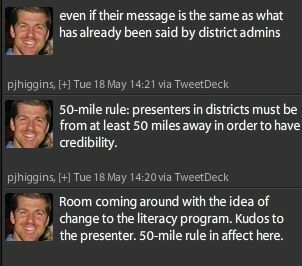 Don't get me wrong here--I enjoy working with districts and I think some great changes have come about individually within some of the people I have spoken to, but I don't understand why we can't celebrate the expertise that exists within our walls. Or, better yet, we can create sustainable professional development models that require multiple investigations into the concepts that are introduced by a one-time speaker. It's those systems I feel are more lacking when it comes to our professional development of teachers.